Large boulders are some of the geological features seen along the Agawa Rock Pictograph Trail in Lake Superior Provincial Park, Ontario, Canada. The Agawa Rock Pictograph Trail is considered to be an intermediate one in skill level and at a mere 0.4 km, still takes about 30 minutes to an hour to complete. Accessed just off Highway 17, north of Agawa Bay, the trail is notable for its geological features and care must be taken especially as one nears the pictographs. 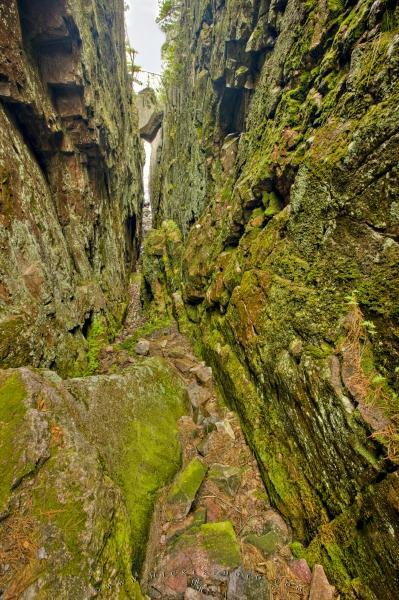 Large rock wedged above a deep chasm along the Agawa Rock Pictographs Trail near the shores of Lake Superior, Lake Superior Provincial Park, Ontario, Canada. Photo of geological features along the Agawa Rock Pictograph Trail in Ontario.